There is no hard evidence that Jack London was a "diehard" racist. He was not a member of any racist organizations, nor did he espouse any racist views during his run for mayor of Oakland. London commented "to hell with the constitution," quoting abolitionist leader William Lloyd Garrison, when that document was used to defend slavery. Neither should London be condemned because of his fictional writings just because some people figure authors only express their own views when writing fiction. By that standard, we should condemn Alfred Hitchcock as a murderer. Finally, and most importantly, we honor Jack London not as a sociologist or a politician, but as writer of adventure stories. Jack London wasn't perfect, but this is a terribly one-sided article. Jack London was raised the first years of his life by Jennie Prentiss, a black woman who had been born into slavery. She took him to church, the First African Methodist Episcopal church in Oakland, and he later donated a large sum to the church. Many of the newspaper articles he's slammed for are actually more balanced than the headlines (written by the newspaper editors) for them would suggest. Unsurprisingly, many white Berkeleyites don't enjoy the open acknowledgement that the most recent zoning and building restrictions are meant to keep the foothill neighborhoods white — and have succeeded in doing so adroitly. These same people will view themselves as enlightened when the zoning and building restrictions are reduced now that primarily white gentrifiers are the only ones who can afford new rentals or condos in the bay. I wish this story included the fact that organizations that preserve local history and protect architecture have fully owned this fact and have shared the information as the controversial information it is in their tours for the public. Therefore, efforts to remedy the past by recognizing it and education of the tour attendees have been made (without pressure), and it is completely misrepresentative of the author of this to not acknowledge it. I'm not surprised to find monumental structures in the Bay Area that mark American racism. I was raised in Oakland, and I attended Berkeley public schools. I used to play at Le Conte Elementary School on the weekends with a friend who lived nearby. As a UC Berkeley graduate student, I took a class last semester in Le Conte Hall. I'm less concerned with these racist structures and more concerned with structural racism that is embedded within economic and social policies in the Bay Area today. The historical impact of redlining that prevented black people and other people of color from buying homes, school tracking programs that excluded students of color from enrolling in college preparatory classes, and police profiling that still contributes to the number of black and brown people in prison — to name a few — are well and alive in this "progressive" haven. Until everyone has an equal opportunity to home ownership, education, and just protection from law enforcement, these hidden structures will continue to hold far more power than racist monuments. So, although it's terrible that these physical structures exist in the Bay Area, my bigger concern is with the hidden structures that allow our country's legacy of racism to thrive. Albany Hill Park 4 All calls on the city of Albany to vigorously protect our diverse residents and treasured public park lands from the lawsuit recently filed by the Albany Lions Club. The lawsuit seeks to permanently establish a 20-foot lighted Christian cross on public park land atop Albany Hill and to force the city to sell more than an acre of this prime public open space into private hands. We believe that the park land surrounding the cross should not be made private; instead, the cross should be relocated to private land. Public land should not be used to promote one particular religion above others. We seek to make Albany a more inclusive and welcoming community for all. There is no evidence the Lions Club owns the cross. They definitely do not own the land on which the cross sits; the easement only granted access for maintenance. The electrical service was disconnected because it was attached to a tree, which it used as a pole, not because it ran through a tree. The Albany City Council unanimously declared that the cross should go in a February 2016 council meeting; this was not the sentiment of "several officials." A beautiful piece ... more trees, less concrete. Thank you. In Richmond (where I've done literacy work), the kids would tell me there were no trees on their block. I think when Nutiva (chia seeds) moved to Richmond, they underwrote the planting of thousands of trees. Oakland Tales, Lost Secrets of The Town is a novel read by lots of Oakland middle schoolers. The characters time travel to Oakland past, but they also visit Oakland future (where every baby born in Oakland receives an oak tree sapling to plant). A nod to my hope that Oakland's oaks will return. After the dust settles following this event meant to extol Oakland's building potential, what might be the most productive followup, going forward? If the city needs to take up the issue of inclusionary housing and get input from developers, planners, and social equity proponents — perhaps moderated this time by someone like SPUR's Robert Ogilvie, a well-known advocate of community development — we might discover a happier formula for dealing with de facto segregation, seemingly at the heart of our ongoing market-rate-versus-subsidized-housing debate. How can we continue to build enclaves for the wealthy only and, as far away as possible, low income housing for people from another segment of society altogether — and not expect the divisions between the two to deepen even further than the already creepy status quo that, whether intended or inadvertent, years of unenlightened policy has wrought? Building towers for only the wealthiest is how Trump rose to prominence and became for many the most admired man in America. If that's the ideal to which we want our kids to aspire, then let's keep slogging along this same pathetic path — or maybe we should look at a way of tweaking a few basic assumptions so that more folks can be included in the great American dream of liberty and justice for all? Media coverage of the burgeoning recreational marijuana industry's players is important for the public's health. John Geluardi's investigation of Joseph Snow's natural indoor growing practice sheds light on the challenge of cultivating high quantities of pesticide-, mold-, and fungi-free marijuana and tells would-be consumers to be cautious of the safety of the products available on January 1, 2018. The next targets to scrutinize are the testing labs and the state's certification process. While many of California's labs have improved their science and testing processes since the legalization of medical marijuana, the market opportunity of recreational marijuana will draw new scientific players to the field who have the financial support to invest in equipment but who may lack the hard-science know-how. Competition for growers' business could lead to low testing prices at the cost of good science. It's up to the state — and consumers — to hold everyone in the distribution chain accountable. Musicians are important for a quality society, and there's a dire need for more younger folks to understand first-rate music. In 2013, I did an economic impact study of live music on our economy, analyzing New Orleans, Seattle, and Nashville. In every instance where musicians were paid and there was a living wage, it produced secondary employment in hospitality and tourism sectors. Mario Guarneri has done and continues to do an amazing service to jazz music and jazz musicians. Thank you! We, who love this music, appreciate all the work you and your organization are doing to keep the music alive and well. 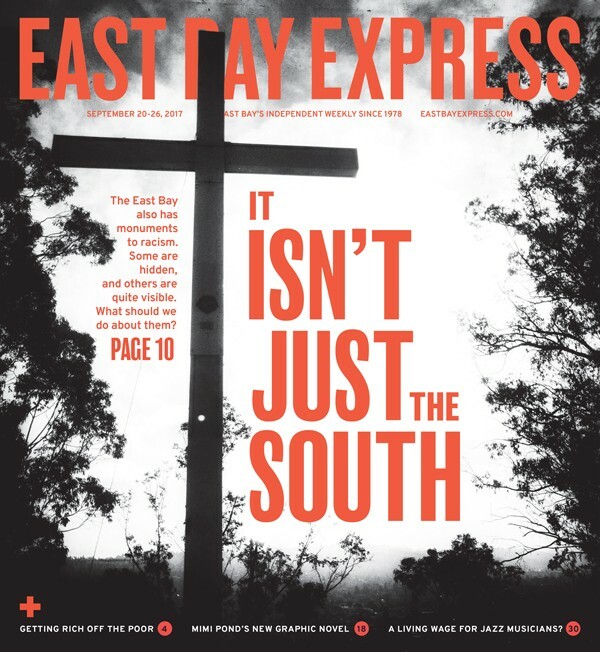 Our Sept. 20 feature story, "A Cross of Hate?" misstated the size of Albany's African-American population in 2010. It was about 4 percent — not less than 1 percent.